Although many people will tell you that Monopoly should come with a warning label that reads “may cause family feud,” MuggleNet completely endorses this version of the classic board game we all know and love. With hundreds of comments on his Potter project, many of which contain messages of desperation, begging, and offers as high as $150 to purchase, Robbie from Collettcreative has created something truly ingenious that has contributed in amazing ways to the Potter community. For those of you who haven’t yet seen this gem, behold – Harry Potter Monopoly! Everything is perfectly done. 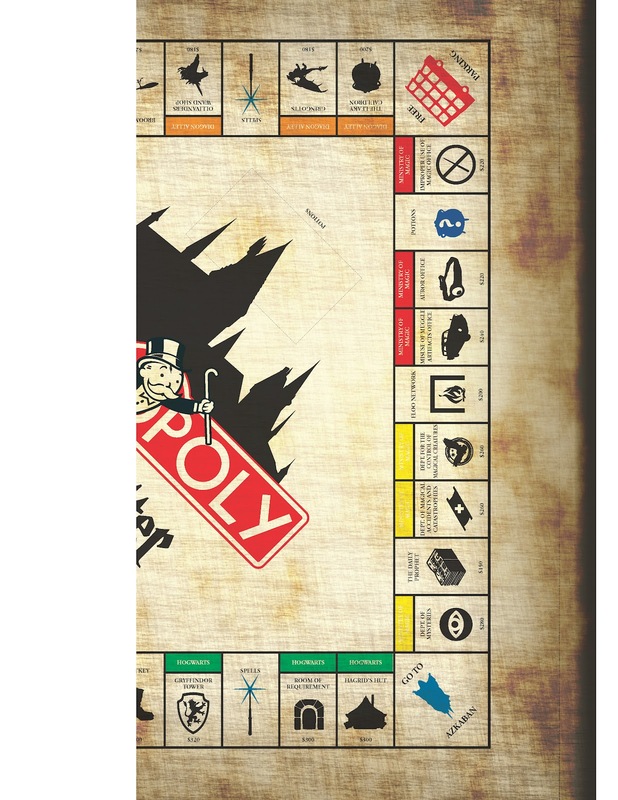 From the “aged” texture of the board, to the creative property and event names, to its uncanny resemblance to the original Monopoly game, Robbie has done a truly outstanding job in mixing two great classics into one fantastic board game. To make his spell cards (these are the “Community Chest” cards in the original), Robbie notes that he prints them on thick yellow paper to emulate the original Monopoly. The “Potions” and “Chance” cards are printed on thick orange paper, standard US letter size. Same process with the property cards, with some added Mod Podge for protection. For those looking to make their own, the printable files can be downloaded here. Please note that these are for personal use only and may not be redistributed or sold. To make the actual board, Robbie printed out his design on large paper. Due to how large the board is, he needed to print the paper in two halves on 17 x 22 paper. He then took Mod Podge and stuck it onto an original Monopoly board and lined the two halves up. Although it took many efforts to get Robbie to read Harry Potter, he finally gave in and unsurprisingly, became a big fan. Other nerdy things he enjoys are Star Wars and Legos. He currently lives in Utah with his wife and daughter, teaching middle school computer classes. Thanks to Robbie for this amazingly creative project! Be sure to check out our other DIY features and project tutorials on our Potter DIY main page here, and don’t forget to send us your own awesome projects at mugglenetdiy@gmail.com! Next story “Alohomora!” Episode 131: “Slow Your Roll” – now available!